Simonne Jeanne Michenon was born in Coulommiers, France on November 1, 1916. 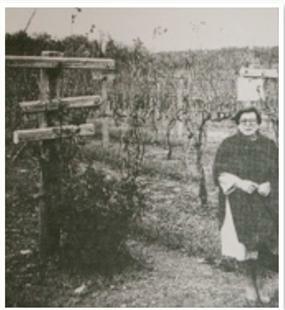 Her family owned and operated a countryside vineyard and she was schooled in Versailles at an all girls academy. An American Education. Her collegiate career took her across the pond to America twice. She initially came to the US as an undergraduate exchange student at prestigious Oberlin College in Ohio. Although she returned home to France after her time at Oberlin, she would make a longer trek to the States as an English literature graduate student at Mills College in California in the decade before the outbreak of the second World War. World War II Back in France with her family by the beginning of the war, she witnessed Paris fall to the German occupying forces. Like many other brave young French women and men, Ms. Michenon responded by joining the French Resistance. During World War II, Simonne Jeanne Michenon, a member of the French Resistance, hid refugees in the curing cellar of her family’s vineyard in France. Her friends remember one particular story she would tell of German troops storming into her family home at the vineyard. Ms. Michenon was cooking at the time, making French sausage, saucisson. She diverted the soldiers with food, wine, and entertaining conversation until, at last, they conducted their search of the house. Feeling the effects of good drink and full stomachs, their search was cursory at best, and they left never having looked in the cellar where refugees were hiding. After the War Ms. Michenon’s education and skills led her to an international life. She worked in Moscow after the war as an interpreter at the French Embassy. She then used the same skill at the fledgling United Nations in New York. Most of her career was spent at NATO from 1949 until her retirement in 1981, at which time she became a resident of Alexandria. A Citizen of the World During retirement, Ms. Michenon volunteered at the National Gallery of Art. Her full life included a love of literature, post-cubism art, travel, classical music, and fine foods and wine. Ms. Michenon died on July 10, 2007, at age 90, of respiratory failure. Her survivors include her son, Jean Pascal Michenon of Fairview Heights, Illinois. Sources: Information for this article was obtained from Patricia Sullivan’s obituary of Ms.Michenon. Please share your memories of Simonne.